The fifth graders at Cottonwood Intermediate school are hosting a fundraiser for Shop with a Cop. The money raised will be tied into the story of their musical called “The Reindeer Games” that will take place on December 8th. From now until December 8th they will be collecting donations. If you would like to support our local Shop with a Cop program or have been wanting to contribute but didn’t know where or how, Cottonwood will gladly take your donations. You can leave it in the office or you can ask to go to the library and donate by voting for your favorite reindeer bucket. 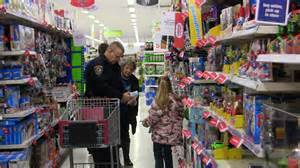 Shop with a Cop is a great organization here in town that finds ways to make the holidays brighter for those going through tough times this holiday season. Cottonwood Intermediate School wants to invite the community in helping them with this great cause and wishes you and yours a Merry Christmas!